“I'm at the mercy of my Internet connection, but driven by the human connection." 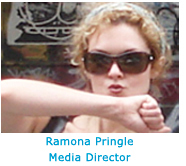 Ramona is an interactive media producer and transmedia artist. As writer, editor, director and actor, she identifies herself as a storyteller, integrating new tools and platforms including social media and participatory user-generated content to evolve the way stories are both shared and experienced. As an Interactive Media Producer, she recently created Your Digital Nation -the participatory story-sharing element of the PBS Frontline documentary Digital Nation. She contributed research to the Douglas Rushkoff book Life, Inc and is working with Rushkoff again on Digital Nation. As a media designer, her recent projects with the Peak Media Collective include Ballerina Remix at the New York Hall of Science, The Media Tree at Casino Niagara and Winter Sky at Sherway Gardens. Ramona is currently developing Emotional Perception in the Interactive Cinematic Experience with the PeakMedia Collective Research Lab, which ogininated in her ITP/NYU Thesis project. Ramona was a host and entertainment reporter for CBC's The X and has acted in productions including Shoot 'Em Up for New Line Cinema, Disney, Columbia, Fox and Lionsgate studios. Ramona holds a Masters Degree in Interactive Media from NYU's Interactive Telecommunications Program at The Tisch School of the Arts, and has a BFA in Film and Video from York University. 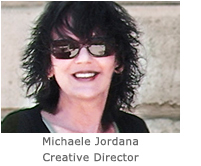 As an Adjunct Professor in the Film and Television Department, Ramona has taught Acting and Directing at NYU.